THE INDUSTRY LEADER IN ALKALINE WATER IONIZER TECHNOLOGY! This high-performance water ionizer by Peak Alkalinity features 13 ultra-efficient platinum-coated titanium plates to treat water and a multi-stage dual carbon filtration system. It also includes a next-generation SMPS 450 watt power system and MaxCool Super Cooling System. The 1301-S system has a sleek and compact design, featuring user-friendly smart touch buttons and a wide display panel. A complete auto-diagnosis system ensures that your Peak Alkalinity water ionizer is long-lasting, so you can continue to easily produce pure and healthy alkaline water. This unit comes with a stylish faucet and BPA-free tubing installation. The faucet boasts smart touch buttons and a full-size, wide color LED panel. 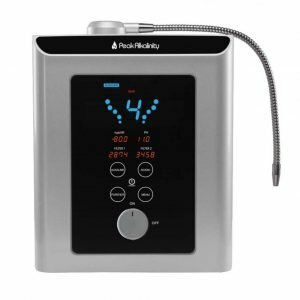 The full-color panel has options for displaying pH levels, the number of liters of filter life left in each filter, water flow rate, activating the auto-diagnosis system and more. 8 programmable languages including English, Spanish, Chinese, Russian, Korean, French, German, and Italian.